Did you happen to see my post from yesterday with the New JustRite Thinking of You stamp set? Have you been checking out the JustRite Blog to see more beautiful samples and a chance to win some blog candy? What do you think of the NEW JustRite stamp sets? Also don't forget to check out all of the links at the bottom of yesterday's post to see even more samples from the JustRite Design Team and I have more links for you today! 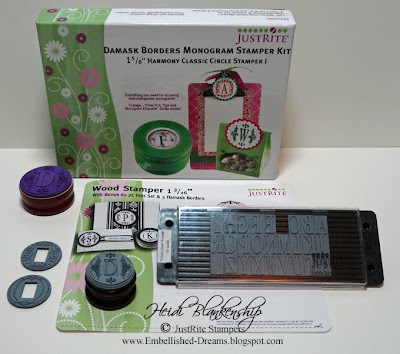 I am very excited to be able to share another JustRite Stampers Reveal with you today! Today's Reveal is the NEW Wood Stamper 1-3/16'' with Bonus 60 pt. Font Set & 3 Damask Borders. 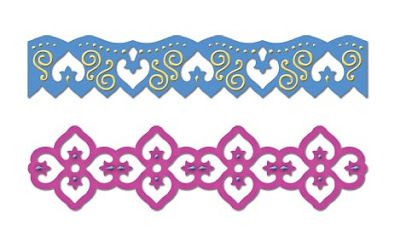 Some of you might be thinking doesn't JustRite Stampers already have a Damask Borders set and the answer is yes, but now there is a small and large set. How terrific is that! I love this NEW little set! Here is a picture to show you the difference in size. For today's project I am going to be using both the NEW Wood Stamper 1-3/16'' with Bonus 60 pt. 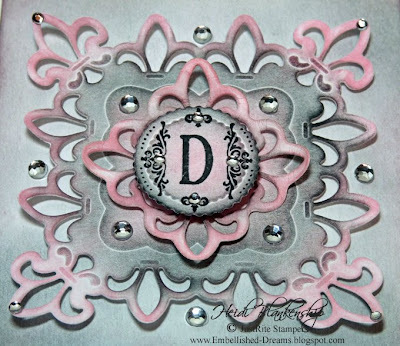 Font Set & 3 Damask Borders and Damask Borders Monogram Stamper Kit 1-5/8'' Harmony Classic Circle Stamper I. 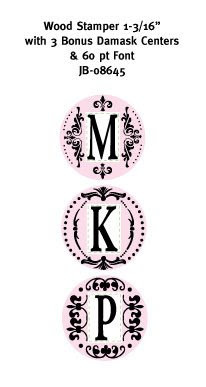 Here is a set of Monogram note cards that I made for a friend. I was very happy with how these cards turned out and they are quick and easy to make with limited supplies. Each card started out as a white base and as you will be able to see in the pictures two of the cards are stamped and embossed and the other two have been stamped and then I used diecuts to do the layering. Three of the cards have the monogram stamped directly on the card front in the center. 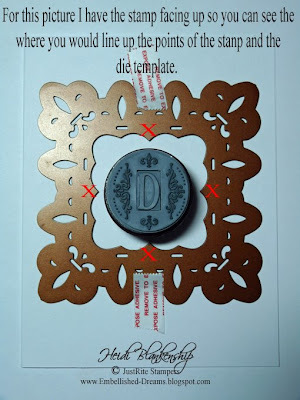 Here is a picture showing you how to do this and be able to line up the stamp with the die template. For the picture I have the stamp facing up and you can see how you would line up the stamp. To start use a removable adhesive to tape down your die template. 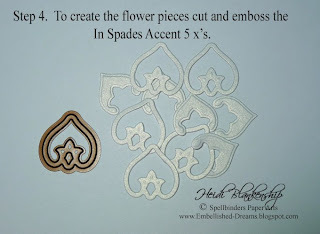 The die template I am using is the NEW Fleur de Lis Pendant S4-204 from Spellbinders. Ink up you stamp and then center it over the opening in the die template and look down towards the bottom of your stamp to line up the points of the stamp with the die template. You might want to practice this on some scrap paper to make sure you are lining it up right before doing this directly on your card front. Now for those of you that might be thinking there is no way I can line that up--no worries--there is always a solution. *wink* If you don't want to try and line up the stamp then just stamp your image on to some cardstock of your choice, line up the die template, emboss and then cut your cardstock to fit the card front and follow the next few steps. 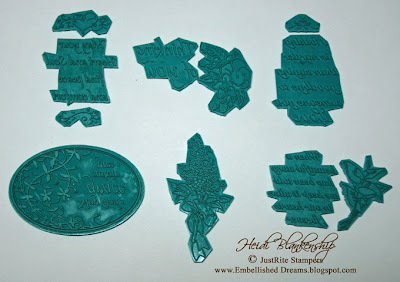 **The next step is for embossing only**, After I had the stamping done then I ran the cardstock through the Wizard with the tan embossing mat. 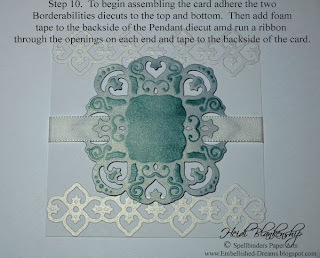 By doing this you will emboss all of the beautiful detail into the card front. For doing this note card set I only used white cardstock. After I had the stamping done I inked the paper with pink and black inks. 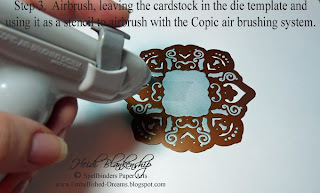 To do this I use a cotton ball, ink it up and then in a circular motion remove some of the ink on a piece of scrap paper until you get the desired color strength and then continue to work in a circular motion adding the ink to your card stock. My sweet friend Linda Duke gave me this fantastic tip about using the cotton balls. I really like the look from the cotton balls, it's a much smoother and softer look. Here's a few close-up pictures of the Monogram Cards. For both of these cards I used the NEW Wood Stamper 1-3/16'' with Bonus 60 pt. Font Set & 3 Damask Borders. Adding the ink really makes the embossing pop. The card on the right is the only one that wasn't stamped directly on to the card front. 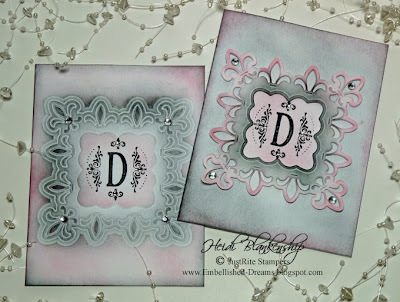 Here is the second set, both of these were stamped on the card front using the Damask Borders Monogram Stamper Kit 1-5/8'' Harmony Classic Circle Stamper I. On the cards with the diecuts I also used foam tape to give the cards some dimension. For a finishing touch I also added some bling to each of the cards. 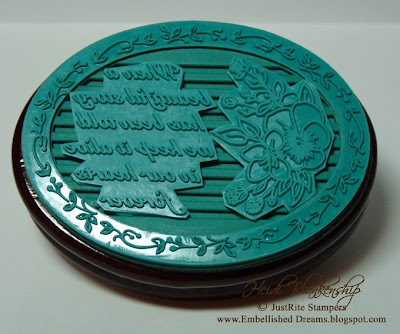 Be sure to hop on over to the JustRite Blog today for a chance to win this NEW Wood Stamper 1-3/16'' with Bonus 60 pt. 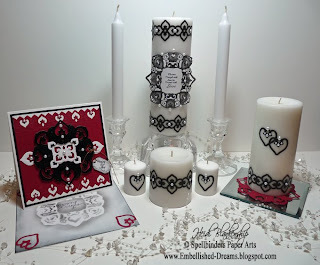 Font Set & 3 Damask Borders stamp set. 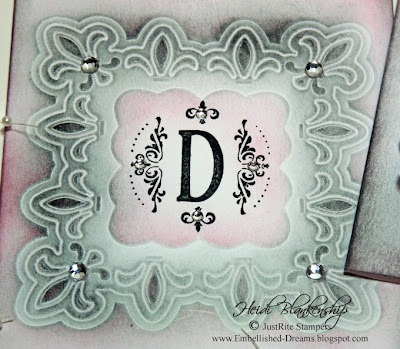 Here are more links to check out with some amazing new designs from the JustRite Design Team--Lisa--Monogram Purse, Thinking of You, Michele Kovack-Mini Damask Monogram, *Michele also has some BLOG Candy! *, Kathy-B&W with a splash of Red Damask, Debbie-JustRite for Sympathy, Sharon Harnist-JustRite City Girl Salsa, Becca-Peace and Comfort. Thank you so much for stopping by today! 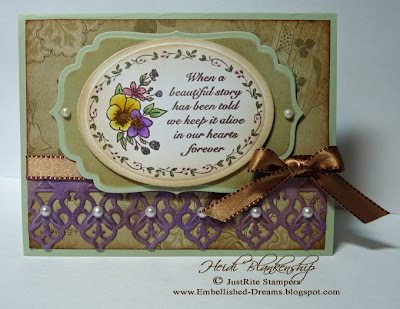 I hope you are enjoying all of the Fabulous Reveals from JustRite Stampers!! Today I have a special reveal for you with the NEW Thinking of You stamp set from JustRite Stampers. 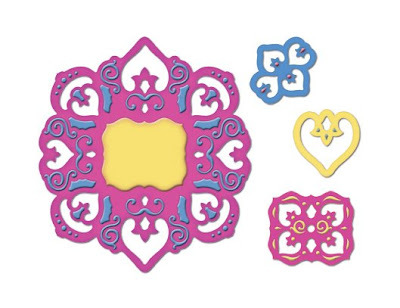 This set contains 6 Borders & Centers to be used with the Oval Wood Stamper 2-1/4'' x 3-1/16''. In this set you will find not only wonderful sentiments but also beautiful images that can be colored in. Also you will notice something a little different in the set, 3 of the centers are horizontal and 3 are vertical. The release date for the JustRite Thinking of You stamp set is July 7th--that's just around the corner! Also if you visit the JustRite Blog (a little later this afternoon **Edit Note** the post is up!!) you will be able to see more beautiful samples and have a chance to win some BLOG CANDY!! 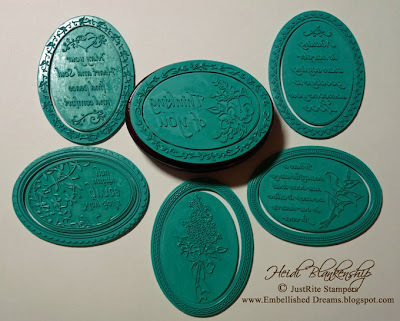 Click HERE to hop on over to the JustRite Stampers Blog! 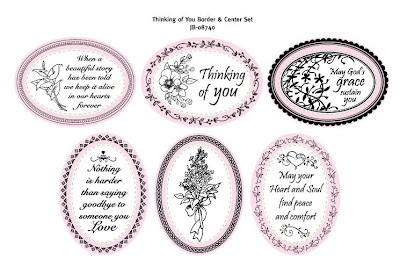 Here's a picture of the Centers and Borders includes in the Thinking of You JustRite stamp set. As many of you know I love to trim my JustRite stamps. 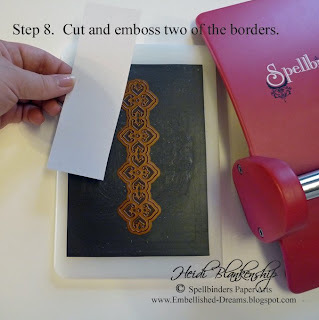 By trimming the stamps you will have more separate sentiments and images to work with and it will allow you to play mix and match with the stamps. Now here is a picture of the stamp set after I have trimmed it. I left one of the stamps as is because it has a border around it. By trimming the other Centers I now have six separate images and four sentiments to work with. 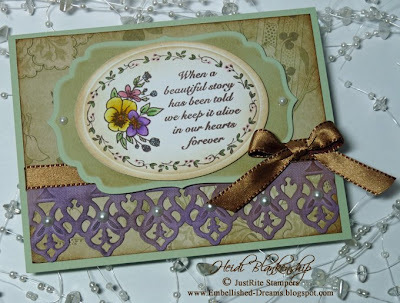 On the card I am sharing with you today I used the little flower cluster image and the beautiful story sentiment in the center. Here is a close-up of the stamps I used for the Center & Border. 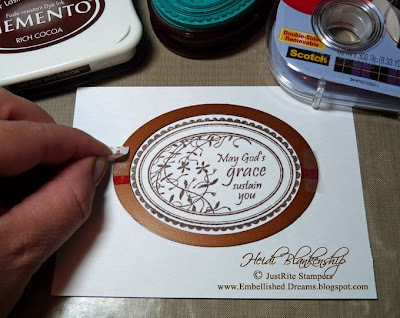 I started out with stamping the sentiment and image using Memento Rich Cocoa Ink from Tsukineko on white cardstock. Then I colored the image using Copic markers (listed below). After I had the image colored then I used the Wizard and Sm. 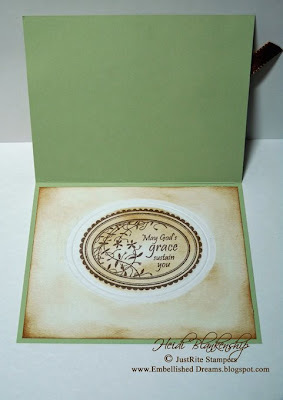 Classic Oval Nestabilty S4-112 die template from Spellbinders to cut and emboss an oval. I used Antique Linen ink from Ranger with a cotton ball to ink the edges. 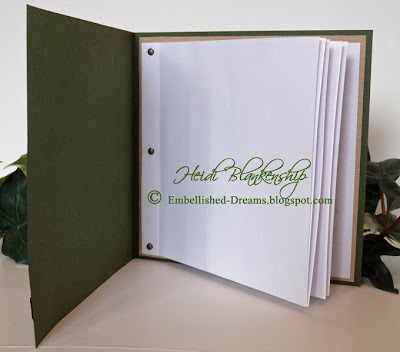 Then I used the largest die template in the Labels Four S4-190 die template set from Spellbinders to make a label diecut with Light Spring Green cardstock from WorldWin. Before removing the cardstock I inked the inside edges using Vintage Photo Ink from Ranger. Next using my Wizard I cut and embossed a beautiful lace border using the Classic Lace Border Grand S7-014 die template from Spellbinders and Lovely Lilac cardstock from WorldWin. The Grand Borders are 12'' long but you can cut them down to size to fit your cards. 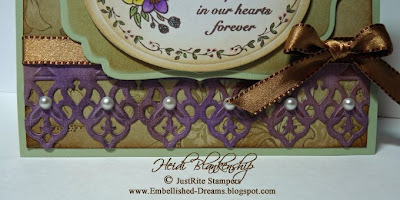 I also inked the edges of the of the lace border using Vintage Photo and Dusty Concord Distress Ink from Ranger. Next I went looking through my Designer Paper and found a pretty floral print from Crafty Secrets, Designer Earthy Paper Pad. I inked the edges with Vintage Photo and I added the lace border and ribbon. Then I applied the mat to the card front and added the labels diecut and the center image and sentiment. I added foam tape to both the label and the oval diecuts to give some dimension to the card. For a finishing touch I also added some ivory pearls from Creative Impressions on the lace border and the label. 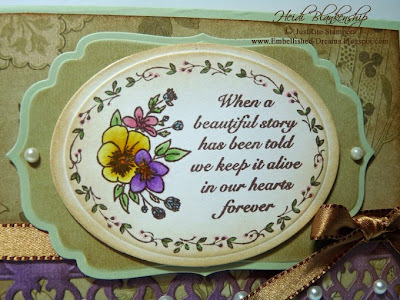 I just love the sentiment with the Thinking of You set and I wanted to add another sentiment to the inside of the card. 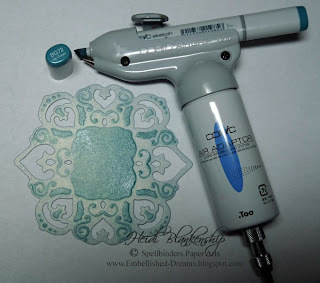 First I centered my stamp where I wanted to place it on the cardstock and then I stamped the image. Next I place the Sm. Classic Ovals S4-112 die template from Spellbinders over the stamped image and I taped it down using Scotch Double-Sided Removable Scrapbooking Tape . Here is a little tip for you, peel off the top layer of paper on the tape, the tape itself is thin enough to go through the Wizard and not leave an embossed mark. 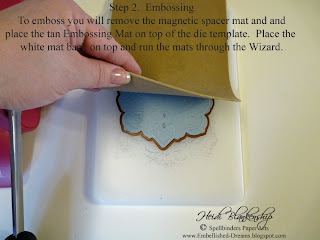 Then I ran the cardstock through the Wizard using the white mats and tan embossing mat to emboss the oval. After I embossed the oval then I used Vintage Photo Distress Ink to ink the inside edges around the die template and then holding the die template in place I removed the tape and then inked the outside edges. Other~Spellbinders-Wizard, Classic Lace Border Grand S7-014, Classic Ovals Sm. S4-112, Labels Four S4-190, Copic-Y00, Y11, Y15, Y19, YG00, YG63, G24, G40, YR04, V04, V12, V17, BV000, B21, R81, R85, Creative Impressions-Bits of Bling Ivory Pearls, Brown/Gold Ribbon, Scotch Double-Sided Removable Scrapbooking Tape, Foam Tape, Cotton Balls So what do you think of the NEW Thinking of You stamp set from JustRite Stampers? I think the sentiments are so wonderful and the images are beautiful and fun to color! 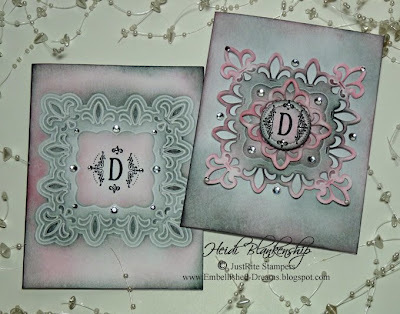 Don't forget to check out the JustRite Stampers Blog for your chance to win some Blog Candy and see more beautiful samples!! Also if you would like to see more samples from the JustRite Designers with the NEW JustRite stamp sets please check out these links~Michelle- What is in Mish's Mason Jars?? ?, Becca-Great Expectations, Kellie-Thinking of You and Sharon Johnson-When a Sympathy Card Needs to be JustRite. Thanks so much for stopping by today and I hope you have a Fantastic Day! 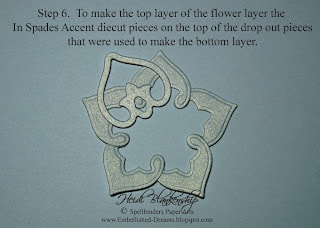 Welcome to Day 6 of the Spellbinders Shapeabilities Pendants Blog Frenzy! Commenting on this post is welcome but does not enter you into the contest. This contest is sponsored directly by Spellbinders Paper Arts. Please read the post to find directions for entering. If you have any questions, please e-mail PenContestQuestions@Spellbinders.us . 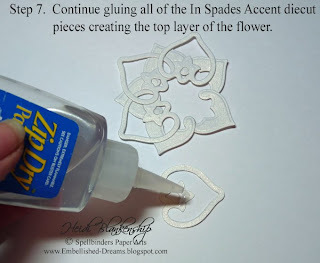 Welcome to the 6th day of Spellbinders Pendants Blog Frenzy! and until June 28, 11:59 pm EST to enter mine. 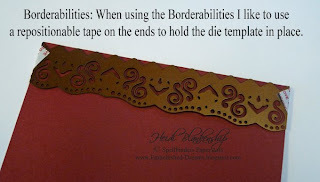 **Edit Note**The Contest for Day 6 of the Spellbinders Blog Frenzy is Closed. Thank you so much to all who entered!! I hope you have enjoyed all of the Blog Frenzy reveals from this past week! 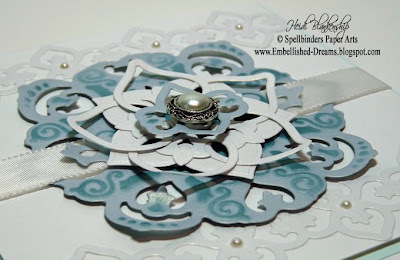 I know I have really enjoyed seeing what the other design team members have created using the NEW Spellbinders Pendants and Borderabilities die templates! 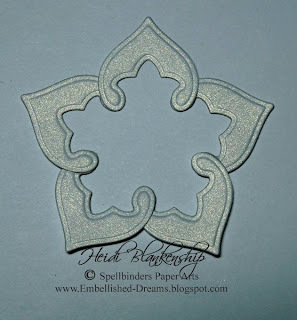 Now that we have all of the business and rules out of the way I am very excited to reveal the following NEW Spellbinders Pendants and Spellbinders Borderabilities die templates. Here's a couple of pictures of the In Spades Pendant die templates. The first picture is showing how you can place the Center die template into the center of the Pendant die template. The set of In Spades die templates contains a large Pendant, a Center and two Accents. The Pendant die template is approximately 4-1/2 '' x 4'', the Center is 1-3/4'' x 1-1/2'' and the two Accents are 1-1/2'' x 1-1/2''. The detail is amazing and these new Pendant die templates are perfect for layering and adding beautiful dimension to your paper crafting projects! I have a couple of projects to share with you today. For the first one, I created a card with not only the diecuts from one of the S4-208 In Spades Accents, I also used the drop out pieces to create a flower in the center of the Pendant. Here is the step-by-step tutorial. For step # 3 I airbrushed through the Pendant die template. 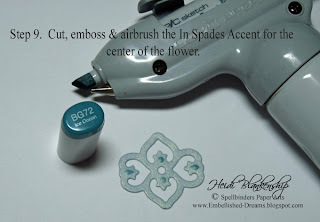 Spellbinders die templates can be used as a stencil and work perfectly for this technique! As an added bonus the NEW Pendant and Borderabilites die templates have so many drop out pieces from the diecuts that the possibilities for layering and creating are endless. In step # 10 you will begin to assemble the card. 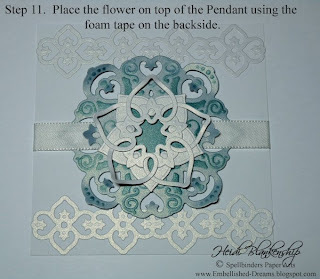 When I am creating with the Pendant die templates I love to layer and add foam tape, doing this will create even more dimension in my projects. Step 12: I added the other small Accent piece to the center with a decorative button on top. I also added some tiny pearls for embellishments to the borders. 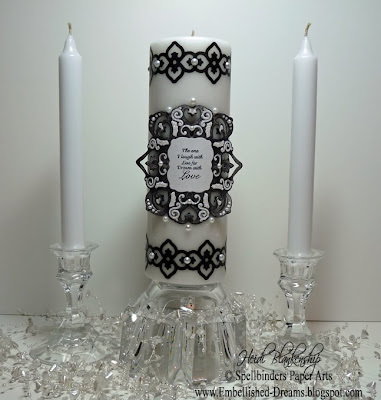 The second project I created is a wedding ensemble of candles and a matching card for the bride and groom. Here is a close-up picture of the candles. You will want to make sure you stop back by my blog as I will be sharing step-by-step how to make these beautiful candles. 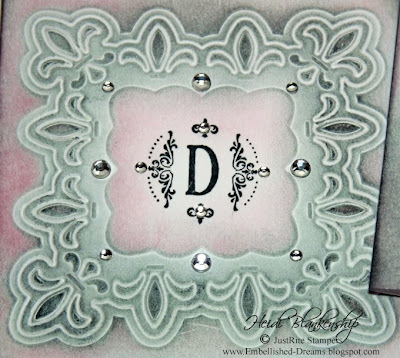 As you see in the card above, I used one of the In Spades Borderabilities die templates that make a decorative cut edge on your cards. Here are a couple of pictures to show you how I place the die template on the cardstock and use repositionable adhesive to hold it in place. 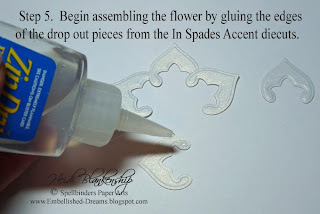 Thank you so much for stopping by and joining in all the fun of the Spellbinders Shapeabilities Pendants Blog Frenzy! I hope you have enjoyed the projects I shared with you today. I hope you have enjoyed all of the projects made by the other Design Team members and the projects still to come! 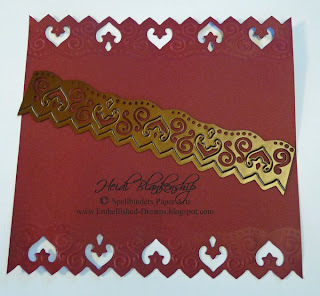 Did you see the Big Announcement on the Spellbinders Blog? Click HERE to read all about it! Starting June 22 you are invited to join in an Eight Day Celebration Blog Frenzy!! Are you wondering what the Blog Frenzy is all about? As many of you know Spellbinders is at the top of the paper crafting industry and always on the cutting edge to design the most beautifully detailed die templates that we all know and love and they have done it again with Spellbinders Shapeability Pendants Die Templates!! All I can say is you are going to ABSOLUTELY LOVE AND WANT THEM ALL!!! 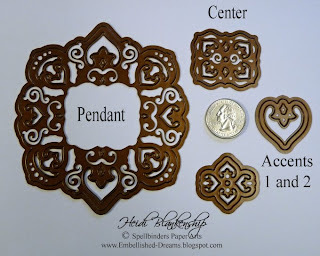 Starting on June 22, each day a different Spellbinders Designer will feature one of these amazing Pendant die templates! Blog visitors can sign up during specified times for a chance to win that day’s featured prize. Visit all the blogs and enter to be eligible to win the Grand Prize! Believe me you won't want to miss the Spellbinders Pendant Blog Frenzy, so be sure to mark your calendars and subscribe to the blogs!! Also click HERE for the Blog Frenzy Line Up. 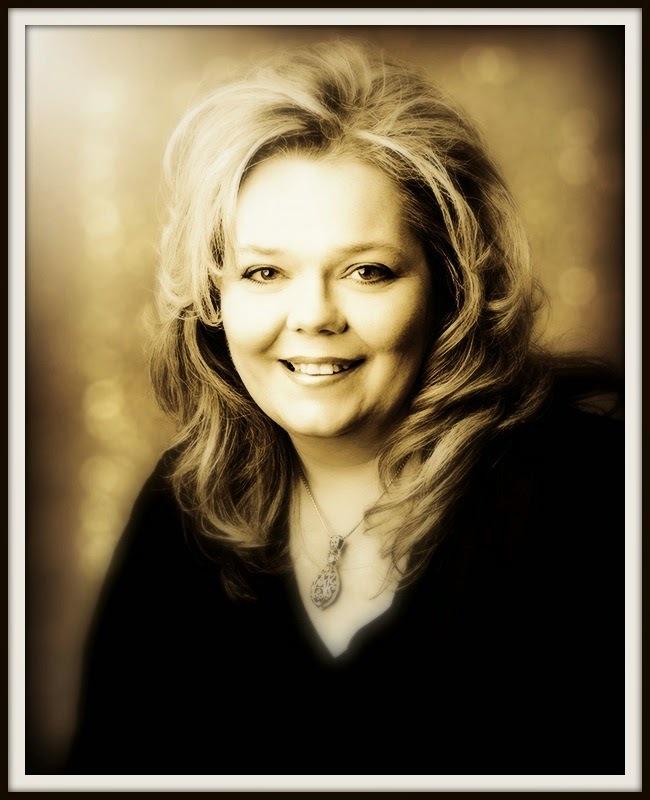 I am sure some of you have been thinking what happened, she posted everyday last week and then nothing for this week--I'm sorry and I apologize but now after reading about the Spellbinders Blog Frenzy you know what I have been up to. I have been busy playing with the NEW Pendant die templates and creating some really fun stuff that I will soon be able to share with all of you. Ok, now for today's card, this is a card that I created for my Spellbinders DT tryout that I never got around to sharing with all of you. 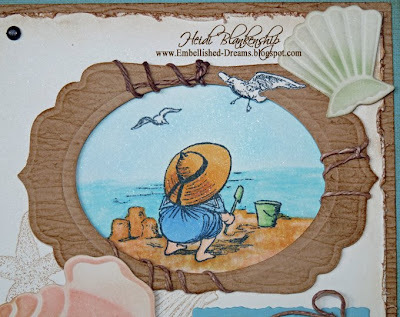 The weather has warmed up and this weekend is officially the beginning of summer so I thought a seaside card would be perfect to share. All of the cardstock is from WorldWin and all of the coloring was done using Copic sketch markers and the air brush system. I love how you can get very vibrant colors from Copic markers but also very soft colors and for this card I wanted to have the softer colors. 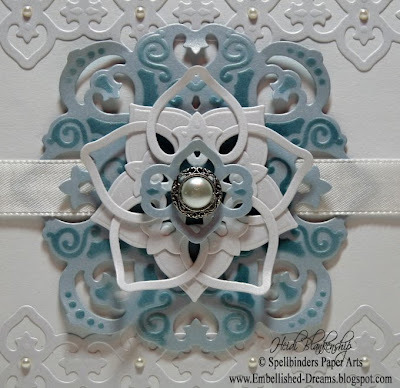 The shell diecuts were made using the Wizard and the Shells S4-016 die template from Spellbinders. After I cut and embossed the shells I left the cardstock in the die template and used the template as a stencil and added the colors with airbrushing. I used the darker colors first and then I removed the cardstock and used a lighter color over the entire diecut. Is this not the most adorable image? I just love this stamped image of the little girl at the seaside. 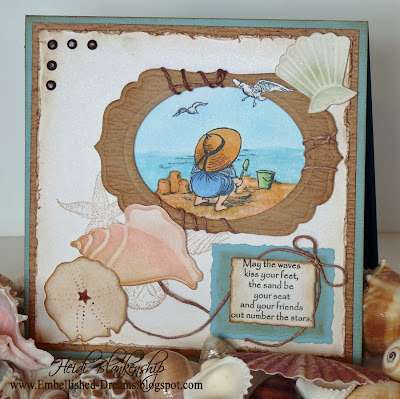 All of the stamped images and the sentiment are from Crafty Secrets Seaside stamp set. The image of the little girl was stamped with Memento Tuxedo Black ink from Tsukineko and then colored in using Copic markers. To make the frame I used the Labels Four S4-190 and Classic Ovals Lg. 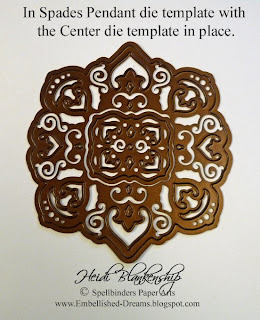 S4-110 die templates from Spellbinders. The sentiment was stamped onto the diecuts made using the Deckled Rectangles Sm. S4-201 from Spellbinders. I also did some inking and distressing around the edges and added a few brown brads and some twill thread. Thanks so much for stopping by today!! 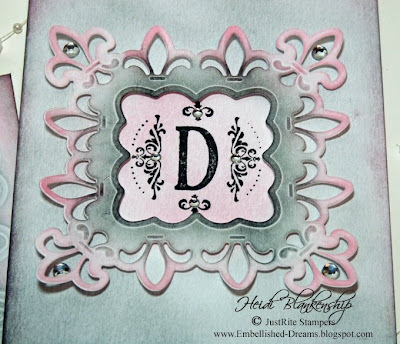 Don't forget to check out the Spellbinders Blog and all of the wonderful Spellbinders Designers. I look forward to seeing all of the fantastic projects the ladies will be sharing next week and I can't wait to show you what I have designed! It's going to be a short and quick post for today. We have a lot going on this weekend with family here and this weekend is Eddie Cochran weekend. Eddie Cochran was born right here in the small town of Albert Lea. He was a musician in the late 1950's and early 1960's, he was best know for his most famous hit, "Summertime Blues". There are several events planned throughout the weekend so it should be a fun one! The card I am sharing with you today is one that I made a while back for one of my husbands co-workers. The co-worker was in the hospital and several of the employees wanted to send him their well wishes so my husband asked if I could make a card. The stamped images on the card are all from Stampscapes. 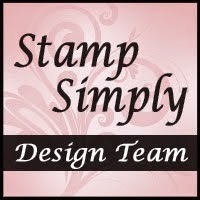 I haven't used my Stampscapes stamps in a while but they are still one of my favorites and they are wonderful for making masculine cards. I used the large Oak Branch-203G stamp for the background on the light brown colored mat. For the main image I used the Oak Branch-203G, Cloud with Sun-108G, and then third one the name has come off of the wooden block so I am not sure but it looks like a pathway. 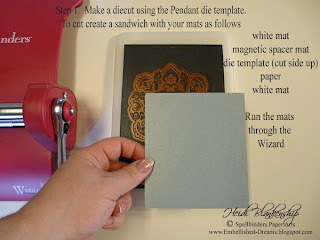 All of the coloring was done with chalks and then I cut out the image using the Wizard and the Labels Two S4-162 die template from Spellbinders. The sentiment was stamped and then I also made a diecut using the Wizard and the Double Ended Tags S3-149 die template. I also added some ribbon, brads and twig punches to finish off the front of the card. For the inside of the card I added several pages, scoring them first and then adding the brads to hold them in place. This is something that is really quick and easy to do and a nice way to give more room for special messages when you have several co-worker signing a card. Thank you so much for stopping by today and I hope you are all having a wonderful weekend!! The sun is shinning here and it looks like it's going to be another beautiful day!